How do you, as a wholesaler, ensure that counterfeit and non-compliant MCBs, RCCBs or RCBOs don’t find their way into your stock? Your installer customers want the reassurance of branded products, sourced from a proven distribution chain. But how can you tell? When is a good deal actually an unsafe deal? Buying safe and sure just got easier thanks to the new Safety Check-list, produced by our colleagues at BEAMA. 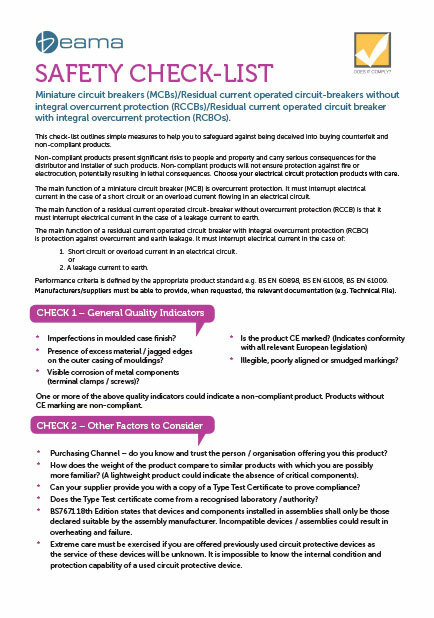 BEAMA’s critical circuit protection components Safety Check-list, for critical electro-technical products MCBs, RCCBs and RCBOs, incorporates a straightforward three step check, taking you through the signs to look for as part of a visual inspection together with the types of questions to ask. Clear diagrams show you exactly what key markings to look for. Download your PDF copy by clicking on the image below. Follow the Check-list’s three-step advice as part of your purchasing decisions and cut the risk to people, reputation and your business posed by potentially unsafe products.